A driver who claims to have disarmed a man with an air rifle after he shot his car does not believe the police have done enough to catch the perpetrator. Ricky Nash (47) was driving on St John’s Street towards the Bishop’s Road mini roundabout late last Friday morning when his BMW X3 was struck by a pellet fired from a tent to his right. Mr Nash had wife Joanne (51), daughter Eva (17) and son Danny (10) in the car with him when the pellet struck the car, causing a dent. Mr Nash said: “My children were in the car and were very shocked. It could have been worse than it was. I pulled up about 30 yards further on and said to my missus ‘I’m going to do what we can’. “He must have been firing at everyone. “I took it upon myself to disarm him because there were other people in the area and I’m quite a big chap. “I approached the tent, heard another shot and stood back. Then I quickly went into the tent and grabbed the barrel of the gun . Mr Nash from Downham Market in Norfolk was on his way into the centre of Peterborough when his car was hit. He now has to pay an excess of £400 to his insurance company to repair the damage. He said the shooter was an English man in his early 20s who was going bald but had short, dark hair. He also had young stubble and was wearing a dark hoody. 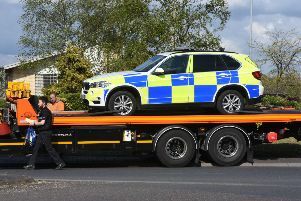 A police spokesman said the force was called to “complaints of criminal damage” in which a car has been shot with an air rifle, but enquiries are not ongoing. Responding to that, Mr Nash said: “Knife crime is quite high on the agenda, as well as shootings. There weer no armed response unit sent out - it was a normal PC. Anyone with information is asked to report online at: www.camps.police.uk/report or call 101 quoting: 35/21460/18.